This beachfront condo is a 1 bed/2 bath unit on the 5th floor of building 7. The bedroom has an en-suite bathroom with walk-in shower. A sleeper sofa in the living room allows for up to 4 guests, with the full second bathroom keeping things comfortable for all. 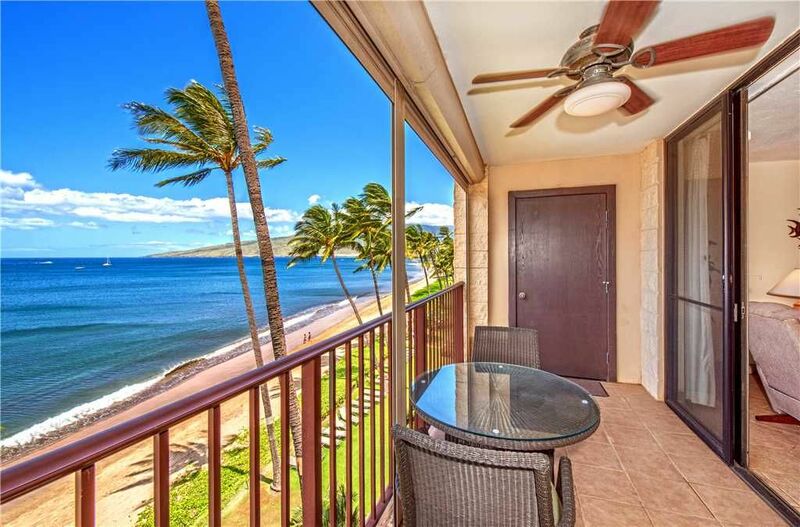 Tile flooring extends onto the lanai with its million-dollar views. As you prep meals in the full kitchen for lanai dining, take advantage of those views as wintering whales play in the bay, paddlers launch from the canoe club, people cavort on the beach, and the sun rises & sets in full stunning color, year-round. Central A/C & ceiling fans keep you cool while complimentary local phone, Wi-Fi & cable TV keep you connected. Convenient coin operated laundry facilities are located on the 3rd and 5th floors by the elevator. During high season (Dec-April) humpback whales (mamas, babies, and guardian males) find shelter in Maalaea Bay; the sight of them breaching is always thrilling. All year round you will savor spectacular sunrises & sunsets by day, and star-studded skies and silvery moonbeams dancing on the Pacific by night. Very happy with this condo and would love to stay here again! Comfortable and spacious. Everything is as advertised. Mahalo for your feedback. We hope to see you here again! Very pleased with our room, it was clean and fully equipped with all our needs. Beautifully decorated. Ocean view is spectacular. Just breath taking. Farmers market is right accross the street next to a convenient store that stays open till 11pm. Location was close to all attraction that Maui has to offer. Will be sure to book our next stay here again. This condo was the perfect fit for just my husband and I. It was a clean and cozy 1 bed room. Beautiful view of the ocean. We both enjoyed lounging in the recliners that were very comfortable. Nice little kitchen that had everything you would need. Right across the street there was a farmers market that had some delicious fresh fruit, great area. Overall it was a great stay. Perfect! Mahalo for your review! We're happy to hear you two enjoyed your time with us! We hope you'll come see us again! Aloha. Wonderful location at Sugar Beach. Fantastic view, you hear the waves breaking at the beach. The property is very well kept - okay, the Elevator makes some noise when stopping at the 5th floor. The Condo is well equipped (some beach stuff like chairs etc. would be nice!!!) Nevertheless we enjoyed the stay very much and would come again. Mahalo for your review. We're happy you enjoyed your time spent here. Each unit should be equipped with beach chairs and a cooler. Our apologies if these items were not in the closet when you arrived. We appreciate you for letting us know, we will make sure they are available for the next guests. Thank you for staying with us! This was our first time to Hawaii and we loved our stay on Sugar Beach ! The unit was perfect for us. I was so nervous picking just the right place for our stay. Kihei Beach Resort turned out to be the perfect choice for us. We talked to several people during our stay that have stayed in difference places on Maui but once they found this resort it is now their go to place each time. We loved how quiet and laid back the area was. Loved our unit The kitchen was well equipped and the furniture was comfy. My husband was glad to have a recliner to kick back in. Loved the view form the balcony. Sugar Beach was great for taking long walks or a run - and the swing in the Banyan tree about a mile walk down the beach was so so cool. The farmer's market and the convenience store was across the street was so convenient. The Hawaiian Shaved Ice across the street was probably TOO convenient; as well as the bakery - SO good ! Everyone was so kind and we would definitely rent this unit again- hoping for a return trip in the future. Thank you so much for taking the time to write a review! We are glad that you had a comfortable stay and got to enjoy all the perks of the area! See you next time! Aloha. It's always a pleasure to have you! See you next year! Mahalo.